FINALLY a way to enjoy one of the most popular fattening dishes of all...pizza! 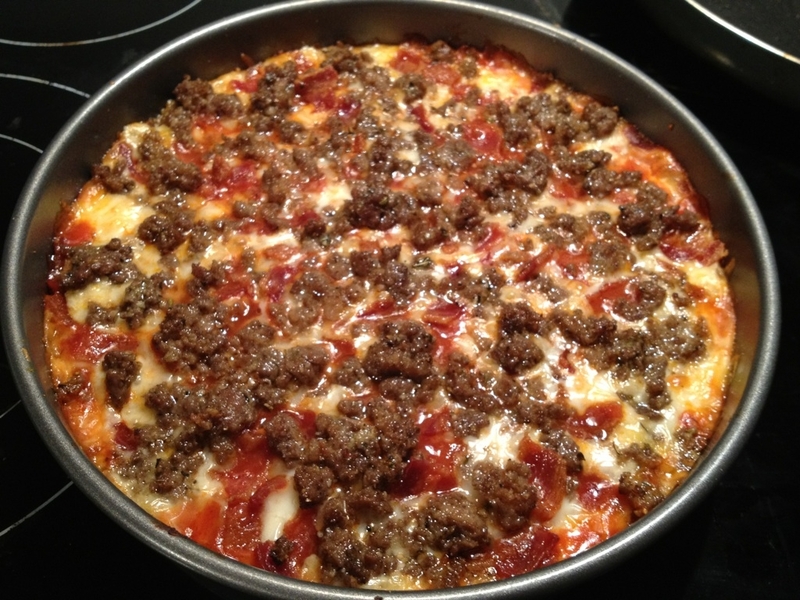 This low carb deep dish pizza is as close to the real thing as it gets! With the only carbs coming from the marinara sauce, this is the ultimate keto meal that is ideal for anyone on a low carb diet! Iv'e tried various forms of low carb pizza recipes from using cauliflower for the pizza crust to tofu for the pizza crust and this is the best deep dish low carb pizza recipe yet! (I will be making a thin crust pizza using cauliflower soon enough so stay tuned!) This crust is made with cheese, cream cheese and eggs and no it does not taste the least bit eggy! You can feel free to choose your toppings of choice but the bison and bacon combination I used was a hit! 3. Add cream, parmesan cheese, and spices and mix again. 9. LET COOL for at least 10 minutes before cutting. Patience is a virtue! If you cut it while its still too hot youll have a mushy and messy pizza!